Stamp with Melva: Home again Home again! I've been home for 2 days and I think I'm getting over the jet lag. This morning it was 6am when I woke instead of 3:30am. I was up at 4:30am yesterday so it definitely felt like a long day. It's taking me a little bit to get back up to speed after being away. Apologies! I have two birthdays over the next couple of days - my husband's and my brother-in-law's - it's a busy weekend with dinners and brunches! Here's the cards I made for both men. I've used Lovely as a Tree (Item 128655) along with Hardwood (Item 133035). 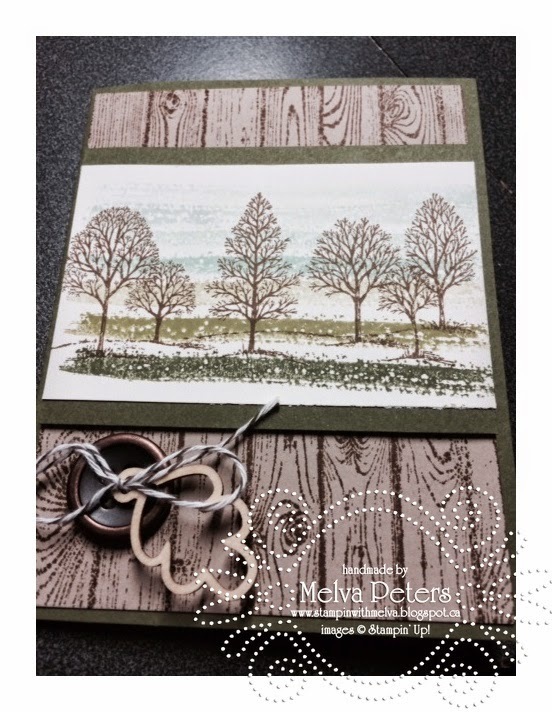 For the background behind the trees I used the swipe stamp from Work of Art (Item 134111) and stamped in varying shades of greens and blues to make the grass and sky. I like how this turned out. Check out the cute Autumn Wooden Elements (Item 135846) - I love these! I'm working on 2 stamping parties for the following week - I can't wait to share the Stampin' Up Holiday Catalogue with friends. No sneak peeks for the projects yet! If you're interested in getting together with your friends to check out the new products and make a cool project, email me and we'll plan a party for you. If you have your party before October 31st and have sales of over $325 you'll earn a free stamp set in addition to the other benefits received for holding a party! Don't miss out! Email me today!